Congratulations to OMA Arts Integration Team for National Conference Selection! the OMA Opera students at Fruchthendler Elementary School on Wednesday, January 23, 2019.
necessary for him to achieve his dream. Dr. Joan Ashcraft presented at the National Association for Music Education (NAfME) Music Program Leaders Forum. Her presentation Orchestrating Purposeful Leadership addressed 55 music leaders from around the country. Now more than ever, music leaders must be champions for change positioning music as an essential tool for learning, social growth, creativity and problem solving. This presentation provided opportunities for participants to examine their own educational environments while rating their person growth as instructional leaders. 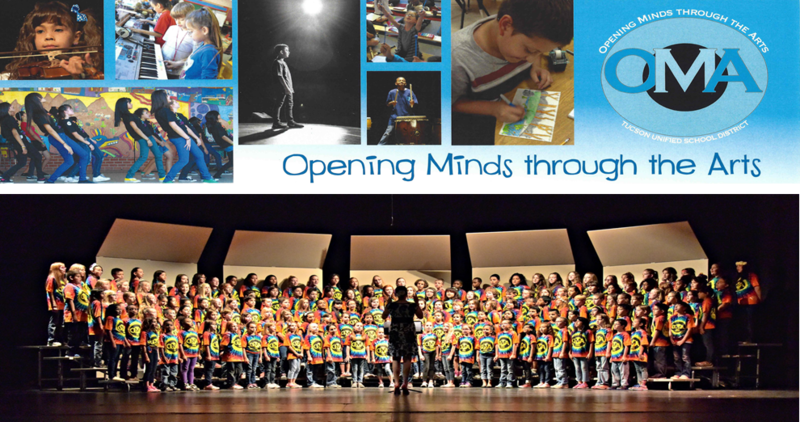 Inspired by exciting, ongoing research into connections between brain development and music, Tucson's Opening Minds through the Arts (OMA program) is a leader in a national movement to integrate arts education with core curriculum. OMA uses instrumental music, opera, dance, theater and visual arts to help teach reading, writing, math and science to children in kindergarten through 8th grade. Each fully implemented OMA school has an Arts Integration Specialist and a team of seven artists who work alongside classroom teachers, adapting each lesson to support teaching of core content and knowledge. In addition, children learn to play the recorder, violin, a wind instrument and keyboard. In Tucson, the OMA program employs 26 artists from the Tucson Symphony Orchestra, Arizona Opera Company, University of Arizona Schools of Music and Dance and other arts organizations to teach 30-minute, twice-weekly classes for 36 weeks of the school year that support core curriculum goals.